NMR is an excellent method to examine reaction mechanisms and derive kinetic data. All species are automatically observed, and their relative concentrations are linearly related. Data are usually collected as an array with equally spaced time intervals. An important element to the process is the extraction and analysis of species’ concentrations from the primary data. 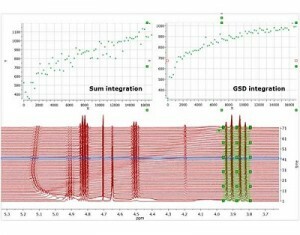 Basic signal processing challenges can be presented, such as baseline distortion, or challenging integration – especially when performed in protonated solvents. Mnova has an excellent base functionality for NMR spectrum manipulation, and integral determination using either conventional methods, or peak deconvolution (GSD). Large 1D spectral arrays can be easily managed in a single analysis, and advanced tools are provided to help the user to quickly generate curves of concentration v time for each species. The process can be simplified using a wizard; equally highly advanced features can be used, such as compensation for dilution during data collection. In this webinar you will be introduced to the relevant processing, data array handling, and reaction monitoring capabilities of Mnova. This webinar took place on Wednesday 23rd of April 2014 at 16:00 CET.